Tetris Unlimited (5.6mb ver0.5 made 2003 by Oscar Giner Martinez, install .exe) is a very nice Tetris clone. 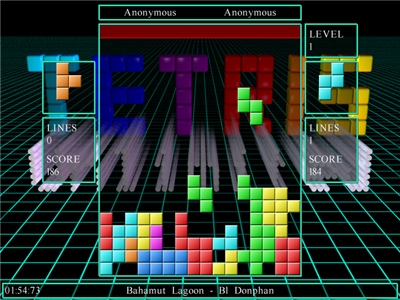 Tetris is one of the most played and loved games around the world. 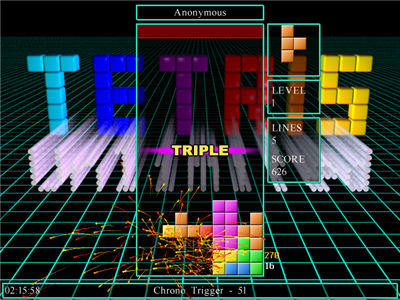 This freeware version is a solid Tetris puzzle game with 10 levels, 6 modes of play; Arcade, Normal, Co-operative, Competitive, Survival and Championship however only 3 modes are available with this current version (Normal, Co-operative and Competitive) and up to 4 players. Create horizontal lines of any colour from the falling blocks to eliminate them. You can move the falling blocks left, right and rotate them but do not allow the blocks to reach the top of the play area or it's game over. You need to create a profile when stating for the first time for high scores and statistics of the games you play. 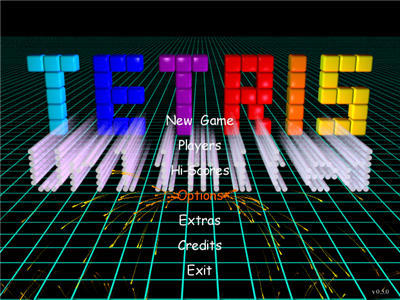 The skins and the background music are editable so you can make it your very own game. All game modes can be customisable: table size, initial and maximum level, Kamikaze mode, Victory condition (for versus modes), time limit etc with mouse and joystick support and a play piece editor. A good game but it would be nice to see the all game modes finished. This game should play on most Windows computers with a basic 3D card.